EFN exists because our agricultural system is beyond broken — and has become devastating to our health, our environment, and our future. As a society, we no longer grow crops primarily for human consumption, but as commodities. We don’t farm in harmony with the environment, but in ways that too often gravely harm it. We’ve largely stopped breeding plants for resilience, taste, and nutritional value: instead we genetically engineer and patent them to accomplish nothing but the maximization of corporate profits. We cannot continue to feed the planet under the current paradigm. Indeed, the more we cede power over land, water, seed and food to corporations, the faster the day approaches when our soils will be too depleted, our crop biodiversity too limited, and our climate too unpredictable for humanity to survive on anything besides cannibalism and cockroaches. Those who say only giant agri-businesses can feed the planet are literally selling the public a bill of goods. Their businesses only survive if they perpetuate the fiction of their own importance. They are chemical companies, munitions companies, repurposed after World War II to wage war on biodiversity and food sovereignty in a desperate bid for profits and continued relevance. To take back our food system, EFN proposes marshaling an army of volunteers to counter the power of the multinational corporations. We’ll need to develop more agricultural cooperatives and strong regional economies like those that thrived before industrialization. We'll need to share resources, especially seeds, land, and education. And we’ll need to collaboratively develop more sustainable growing systems & practices, complete with carbon-sequestering perennial staple crops (including grains and oilseeds), that work in harmony with the natural world. We cannot continue to allow the shortsighted pursuit of profits to dictate the future of our planet. It’s time we take control of our own destiny — and we can’t do it alone. Since most of us are not familiar with the mechanics plant breeding (or organic farming or agroecology, etc), we've compiled the following resources in order to help de-mystify something that was once practiced on almost every farm and in many gardens as well. 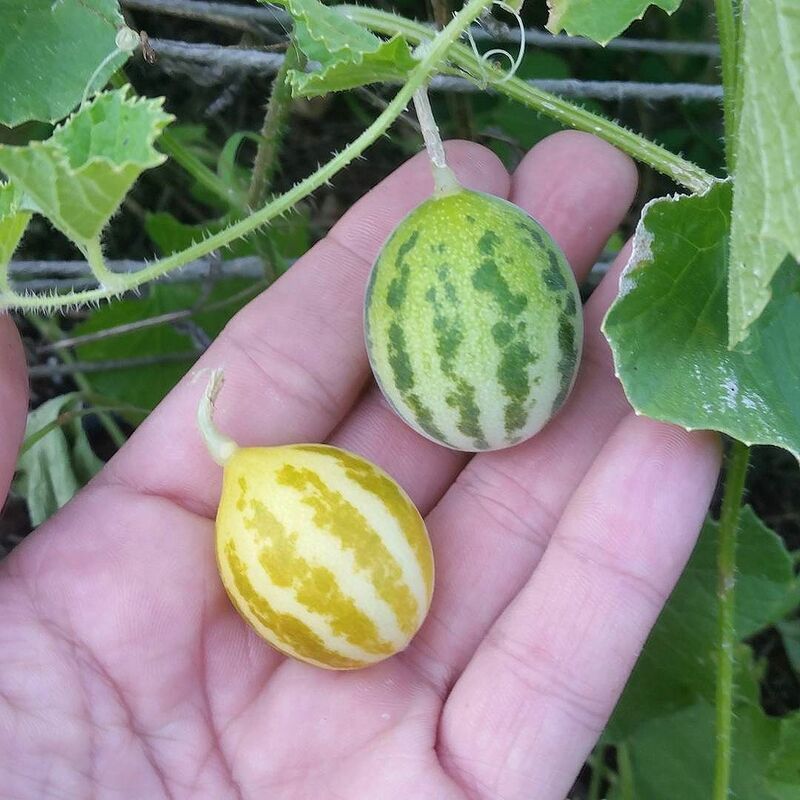 Mouse Melons (Cucumis melo. subsp. agrestis) originally from the Maldives in the Indian Ocean, grown by EFN in 2015. The Maldives are threatened with inundation due to sea-level rise caused by climate change. Carol Deppe Breed Your Own Vegetable Varieties: The Gardener's and Farmer's Guide to Plant Breeding and Seed Saving, 2nd ed.